One of my Christmas traditions is baking. I usually bake gingerbread cookies. But this year, I haven’t cracked one egg and I’m ok with it. I typically love baking. I’ve always looked forward to making something homemade for myself someone special. But this year, I’m just not into it. I think I have finally come to realize a few things about baking. Baking comes with drawbacks. The first and most obvious part is the clean up. I hate the clean up. I wish I could hire someone just to clean up after a day of baking for me. But the less obvious and probably more serious drawback is my lack of self-control. Without a doubt, after every baking session, I feel ill. Now, most bakers know that you’re supposed to wait until the cookies/cakes/pies/biscotti/fudge/brownies are finished and cooled before you eat them. Most baker’s are also aware of the dangers of licking spoons and spatulas because a)OMG raw egg and b)hello, food safety 101. Despite my teenage experience of working in a camp kitchen and my mother’s warnings of the dangers of raw eggs, I still cannot resist the urge to lick that spoon, spatula, mixer, bowl, fork, finger, knife and/or measuring cup*. Without fail, whenever I bake something, I cannot enjoy it when it’s out of the oven and cooled because I’ve already got a stomach ache from taste tests along the way. Therefore, I am not missing my Christmas baking tradition. This year, I am enjoying the baking traditions of others and I’m reveling in the lack of stomach aches. Or, at least the lack of stomach aches before I begin to eat the cookies. Unfortunately, my self-control (or lack of) is still a problem while eating other people’s baked goods. 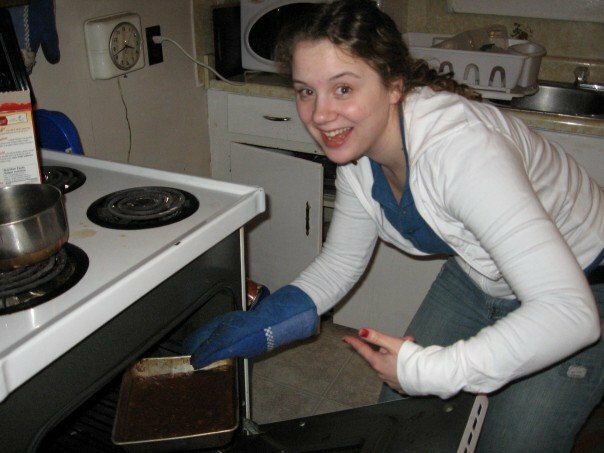 Me baking, many years ago. *A note to all those who have had my baking in the past or may have the pleasure of having it in the future: I still follow basic food safety rules. I only lick a utensil after I’m done with it and never put it back in the bowl (unless I wash it first). Also, I wash my hands. Don’t worry. aw that’s really sad you can’t enjoy what you make! Oh, I enjoy it! I just enjoy it raw and uncooked. It’s my own fault really. Oh goodness. I read the title and thought maybe you and the boy had broken up. Anyway, feel free to bake me anything chocolate anytime you want. I’m even okay if you don’t follow basic food sanitary measures.